NFC is a slick technology for mobile payments, but too often carriers block access. QR code payment systems are easier to use on a number of mobile platforms today. I was confused by Google Wallet at first until I learned you can use NFC to pay for things at hundreds of thousands of PayPass locations around the US. I now prefer to carry my Galaxy Nexus since it is one of the only devices that reliably supports Google Wallet. Since I started using it though, I have learned of several other ways to pay for things with your mobile phone without the need for NFC technology. While I think the future is in NFC and some kind of associated service for mobile payments, you can use several other clients that put a bar code on your mobile phone display that is then scanned by a reader at the store. I use this functionality every other day or so at Starbucks in Seattle with various Starbucks card apps on Android and Windows Phone. I also recently discovered a cool service that works with my favorite lunch teriyaki place called LevelUp. This service works on iOS and Android smartphones in conjunction with a reader at the store where you scan in your barcode to pay. 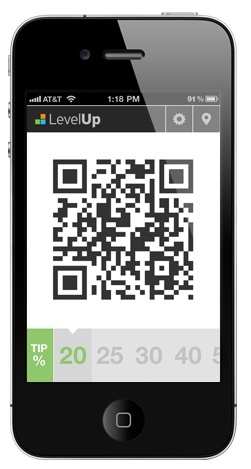 If you have another device, Windows Phone, BlackBerry, or Symbian then you should be able to visit TheLevelUp.com in your browser to get the barcode to appear after you login. I like the easy slider where you can set the tip percentage. When I first signed up I received a $5 credit so more than half my lunch was paid for. You can also earn credits by sharing with friends and by becoming a regular customer. I see that LevelUp works in something like 17 cities, including Seattle, San Francisco, Chicago, Boston, Atlanta, and more with a growing number of merchants. The QR code used to pay for your items is NOT your credit or debit card, but a randomly generated token with no meaningful info in it so they appear to take security quite seriously. James recently wrote about his experiences with parking that was managed by a mobile phone with a QR code element as well. Given that NFC services are poorly supported by US wireless carriers, paying via QR code may be around for longer than we hope. Have you found a service or vendor that lets you pay via a QR code with your mobile phone?